West Total Comfort Enclosures offer design flexibility. 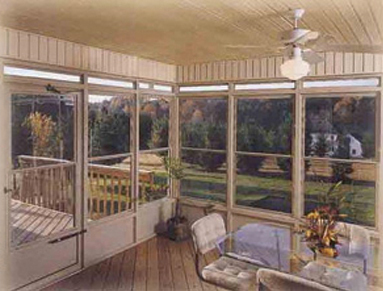 Wall units are suitable for use over concrete slabs or wooden decks and may be installed under an existing roof to make an enclosed porch or sunroom. Storm Room Enclosures... Enclose and Enjoy! The West Storm Room Enclosure allows you to extend your living space at a modest cost, adding to your home's enjoyment and beauty. Each custom designed enclosure uses heavy-duty aluminum storm windows for durable, maintenance-free, three season enjoyment. For both new construction and renovation applications.